Which area is most struck? Re: Where would you go (on Earth) to stand the best chance of seeing lightning? 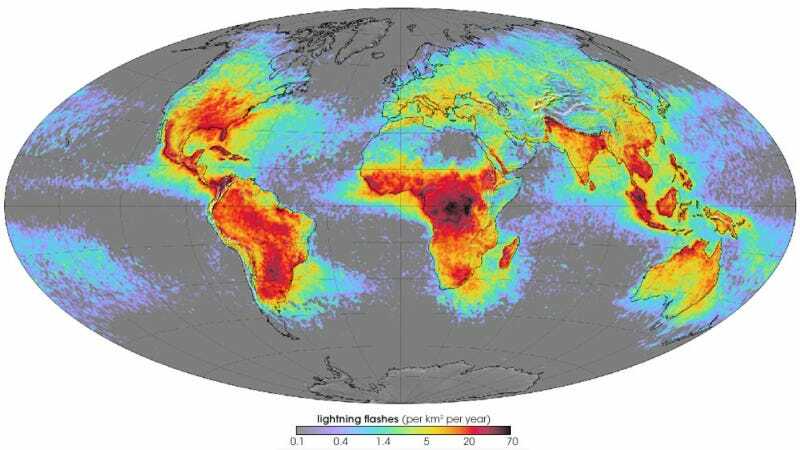 NASA has printed this map showing which parts of the world get hit the most by lightning. The black areas receive 70 lightning flashes for every single square kilometre in a year. That'd be over 200 hits for every square mile. Phew! Click on the map to enlarge it to a decent size. Which single spot on Earth gets the most hits? According to NASA and based on their satellite surveillance systems, the greatest amount of lightning strikes are near the Catatumbo River in Venezuela (where there are 40,000 strikes every night, for most of the yea! and a mountain town in the Democratic Republic of the Congo called Kifuka . You can see in the map above the dark regions indicating thousands of lightning strikes over these areas.